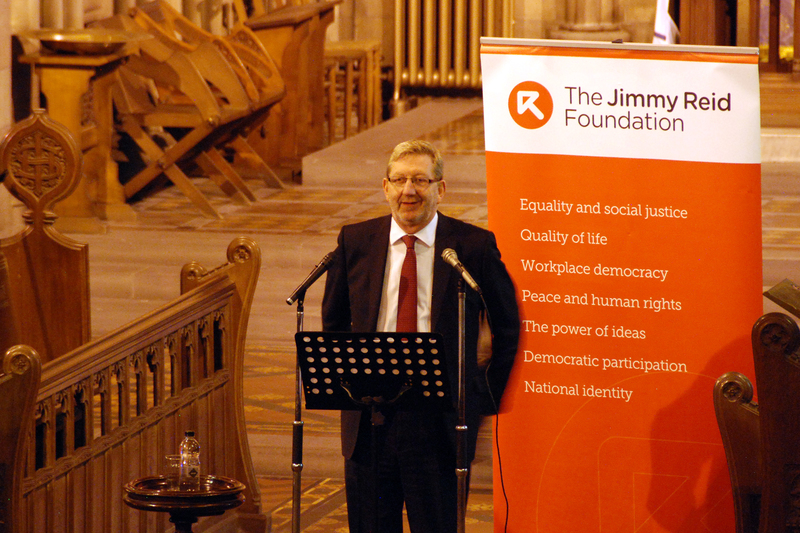 On 10 October General Sectretary of Unite Len McCluskey gave the second Annual Jimmy Reid Memorial Lecture. This is the text of his lecture, entitled We Are Not Rats; the role of workers and trade unions in politics. Jimmy Reid was a giant of our movement – A trade union leader full of compassion and humanity; a towering figure whose life will continue to inspire long into the future – as tonight’s event surely testifies. It is a deep personal honour for me to be invited to give this lecture. As a young shop steward on the Liverpool Docks, I remember Jimmy coming to address us during the Upper Clyde Shipbuilders’ work-in. He lifted our spirits for our own struggles, by his words and his example. And I vividly remember the image of this passionate advocate, with that wonderful accent, making the hair on my neck stand up. This lecture has also given me a good excuse to spend some time reflecting on Jimmy’s life; his radical thinking; his strength in the conduct of industrial battles and his political analysis of Britain during his lifetime; It has been a process that has deepened my own long-held convictions and my solidarity with the simple, deep-rooted principles that Jimmy Reid held – principles of equality, dignity, humanity and social justice. He believed that a better society could be achieved if people were willing to fight for it. It is a belief I have always shared. Jimmy said – at the time of the UCS work-in – “We are taking over the yards because we refuse to accept that faceless men can make these decisions”. Substitute the word “society” for the “the yards” and we have an outlook as relevant today as it was then. Tonight I attempt to explain why that is so. But first let me thank the Jimmy Reid Foundation, established to promote and continue the radical thinking Jimmy was famous for, for tonight’s invitation. I know that the First Minister Alex Salmond delivered the inaugural Jimmy Reid Memorial lecture. I do not agree with Alex on everything – although let me acknowledge that his open-minded approach towards trade unionism offers something which politicians of ALL other parties could learn from – but I will follow in his footsteps in one other respect. He has announced that he would make available the text of Jimmy’s famous Rectoral Address to Glasgow University to every school in Scotland. I’m delighted to follow-suit and announce that Unite will make this available to all of our 1.4 million members – encouraging all of our activists to read it and learn from it. The title of this lecture – you will know – is itself a tribute to that speech: “We are not rats”. “A rat race is for rats. We are not rats”. I remember what a profound affect reading those words had on me as young trade unionist. They expressed the anger I felt at the condition of the working class; and at the contempt in which we were held by the boss class and the elites that ran Britain then as they do today. They are such simple words, exemplifying that great talent Jimmy had to take the most complex of ideas and express them in their most straight forward way. Tonight I am going to focus my remarks on “the role of workers and the trade unions in politics”. As chance would have it, this is the first lecture I have given since I spoke at the LSE earlier this year. Then I had the privilege of speaking in honour of the memory of Ralph Miliband. If the past is a guide, then, we can shortly expect to read an expose in the Daily Mail about Jimmy Reid’s “evil legacy” as a “man who hated Britain”. The curse of McCluskey! Of course, Jimmy Reid would regard such an attack as a badge of honour. Undoubtedly Ed Miliband has spoken up for everyone decent in this country in not only defending the honour of his eminent father, but in exposing the sordid journalistic practices of The Daily Mail. If the Daily Mail had its way, there would be no trade unions, no labour movement, no progressive debate, and all politics would be conducted in a state of synthetic semi-hysteria. And, of course, there would be no Ed Miliband to worry about, since his father, instead of settling in and fighting for Britain, would have perished at the hands of the Nazis who the then Lord Rothermere so admired and held up as a model for Britain. As with his decision to break with the mystique of the Murdoch media over phone-hacking, this is an act of courage by Ed Miliband. I have no doubt that, wherever Jimmy Reid now is, he is cheering him on. The Daily Mail’s raison d’être has always been to defend the power and privilege of the rich, peddling as it does so the type of bigotry and bile that – as Jimmy put it – “dehumanises some people”. The Mail’s attack on Ralph Miliband, who passed away in 1994, was an immigrant Jew to this country as well as a British war veteran, is revealing, and as good a place to start tonight as any. Ralph Miliband didn’t hate our Britain but he did make clear his contempt for the Establishment, what he saw as the old boys network. And yes he did attack ‘Eton and Harrow, Oxford and Cambridge, the great Clubs, the Church, the Army; the values . . . of the ruling orders” He rejected the notion of “workers in their place”, the House of Lords, social hierarchies, God save the Queen. And, yes, he hated the social injustices, the attacks on the working classes, the inequality and poverty, and the anti-democratic forces of the ruling elite that governed Britain. For me, as for Jimmy Reid, to hold such views is to love the Britain of ordinary people; the people who established democracy in the teeth of privilege, who fought fascism, who built our welfare state, who have made our country a cultural beacon, who our generous to the unfortunate, who are tolerant of difference… Who are everything the Daily Mail is not. In honouring Jimmy Reid tonight, we honour that Britain, the Britain which will survive the attacks of this government and which says today as clearly as forty years ago – “We are not Rats”. Jimmy Reid’s life – like that of many activists of the 1960s and 1970s – is full of lessons in how to conduct politics. For many years, of course, Jimmy was a member of the Communist Party, becoming a leading member and for a time its top official in Scotland. This was a time when the Communist Party was intimately and integrally bound up with the labour movement and, indeed, the wider working class, particularly here in Glasgow. I think that what Jimmy learnt from the Communist Party was the seriousness of politics. For him and for many others the Communist Party was about being immersed in the daily life and problems of people in the workplace and the community allied to a vision of a better world which, however flawed in its detail and its application, retained immense mobilising capacity for most of the twentieth century. It was not a politics of opinion polls, of spin doctors, of smart-alec commentary, of cynicism, expense accounts and huddling on a nebulous centre ground. It was a politics of passionate engagement, of principles, and of hard graft; and it was a politics close to the people. Jimmy was forged in a culture which shaped many of the finest working class leaders in Scotland, from John Maclean to Mick McGahey. There are lessons for us here which are so obvious that they hardly need spelling out, but in brief: Be of the people, be with the people, be straight with the people – to lead you have to learn and listen. It is the only way for a political leader to secure the trust of working men and women, a trust which will then forgive you mistakes and misjudgements, because they are never seen as self-interested mistakes. Then in the 1970s Jimmy joined the Labour Party. He recognised and valued the unity of the labour movement in Britain and the fact that it had one electoral expression, the Labour Party, unlike in many other European countries. His many efforts to become a Communist MP, an endeavour in which saving your deposit was held to be a victory, convinced him that there was only one electoral game in town. Today, that remains true. Tomorrow may tell a different tale. But, if I can risk quoting Lenin when the Daily Mail may be listening, the art of politics consists in grasping the key link at a particular moment. So, these truths are presently self-evident: The Tory-led coalition can only be defeated in 2015 by the Labour Party. And it is in everyone’s interests not only for Labour to win that election, but for a Labour government led by Ed Miliband to be radical enough to confront the burning problems our society faces. It is in that context that we need to address the twin debates in the Labour Party today – over its policy proposals, and over its constitutional structure. To take policy first, there is of course scope for the perennial debate – is the glass half full or half empty? But perhaps that is not the real question – we should ask if the glass is filling up or draining away? Put like that the answer cannot really be in doubt. Ed Miliband’s speech to the Labour conference was – some would say – the most genuinely radical we have heard from a Labour leader for nigh on 30 years. Of course, it may not have been radical by the standards of Jimmy Reid and the 1970s, when price controls, for example, where the small change of politics, and the big debates were about public ownership and really tackling inequality. However, to say that the next Labour government will not let the energy monopolies carry on ripping us off, to say that the property speculators will no longer be able to stop our kids getting a decent roof over their heads, and to tell the biggest companies that they are going to have to pay more tax – that is not just a break with the Coalition’s policies, it also represents Labour turning its back on the neo-liberal dogmas which dominated the Blair-Brown years. So I unequivocally welcome Ed’s speech. Allied to his brave stance over Syria – a stance which flew in the face of the unsolicited advice of Tony Blair and which I believe has saved lives by stopping a global rush to war – there is no doubt that this is no longer “new Labour” as we knew it. Disputing that point seems to me to engage in sectarianism of the sought Jimmy Reid would never have countenanced. That does not mean we can be satisfied. I have made it clear that for me the critical question is what the next Labour government will do about trade union freedom. I do not say that just because I’m a trade union leader, but because I believe that social progress is maybe 25% the work of government, and 75% the job of working-class self-organisation. Or, to perhaps put it better, everything the working-class has achieved through the exercise of governmental power has rested upon what it had already achieved in organisation and struggle outside parliament. For example, a statutory living wage would do a lot to reduce inequality, just as the minimum wage has been a major first step. But research shows that the best way to reduce inequality is to give working people full freedom to organise themselves in trade unions. Unions are the main – indeed the only – force able to balance the otherwise uncontrolled power of the employer who, whether they are good or bad, can only ultimately be driven by the principle of profit maximisation. I would go further – our history shows that trade unionism is the main bulwark of democracy Of gender and racial equality Of peace Of anti-fascism Of proper welfare provision In fact – of almost everything that marks civilisation out from barbarism I don’t dispute for a moment the part played by others, from other classes, in many of these achievements. But history tells us only an organised working class has achieved the strength to impose them on the powerful. That is why trade union freedom – real rights to organise and fight for rights at work, the sort taken for granted elsewhere in Europe – is vital if the next Labour government is to build the good society Ed Miliband speaks of. It can’t all be done from Westminster. It needs a vibrant civil society, with trade unionism at its heart. And – let me be clear – it needs a vibrant Labour Party with trade unionism at its heart too. Breaking the link with trade unions is today, as it always has been , a right-wing agenda. It speaks to a class fear, which I remember being expressed by the Economist magazine years ago, in the early 1980s, when it wrote that “no Party organisationally, financially or constitutionally dependent on organised labour must ever be allowed to rule Britain again.” That’s what lies behind the incessant attacks on our political work by the Tories and the media, and the unfortunate echo those attacks sometimes find within the Labour Party itself. It is the view that even if organised labour is an unavoidable evil, it must be kept firmly outside the political arena – that politics is, in the end, reserved for those whose interests are aligned with the propertied classes. Well, for thirty years the Economist had its way. The ruinous results are all around us. Today, we would with far more justice say that no party financially or politically dependent on the City of London, the hedge funds and the bond market should ever be allowed to rule Britain or anywhere in the world ever again. So that’s why the union-Labour link is a question of principle. It is not about how Labour funds itself. It is about how democratic we are as a society, about whether the formal equality of capitalist society can ever become a real equality. In short – do working people have a place in politics. It is a matter of principle, but not an unchanging one. How working people organise and engage with politics and the life of the community today is not the same as it was a century ago. Jimmy Reid would, I think, have been dismissive of those in our movement who always wanted to stand firm on cut-and-dried schemes shaped many years ago. So that is why I am up for the debate about how to improve and develop the way trade unions and the Labour Party work together. I’m only sorry – and I could not come to Scotland without making this point – that the debate arose out of disgraceful attacks by the right-wing on my union and its activists in Falkirk. I believe that there is a prize at the end of this debate – a renewed Labour Party which remains the historic expression of organised labour at the centre of a broad coalition for social progress, but with a more dynamic democracy and a deeper popular participation than it has enjoyed for many years. Of course, there are those with other agendas. Last week at their conference the Tories were talking about still further anti-union laws, designed to further cripple our right to organise, to take strike action, and to engage in democratic politics. I have said it before, but let me say it again. Trade unions are not cavalier regarding the law, and we acknowledge our common obligations. But we are not going to let ourselves be rendered impotent and redundant through death by a thousand legal cuts. If the Tories are not prepared to allow for genuine legal trade unionism then our priority must be clear – to stand up for our members whatever the law says and to make such changes to our ways of working as will allow us to do so. There are more ways than one to skin a cat. After all, Jimmy Reid didn’t check in with the High Court before organising the UCS sit-in. He did what was needed without bothering a solicitor for advice first. Our attitude must be the same – if the Tories abuse the law to render effective trade unionism illegal, then we will not be bound by it. Colleagues It would of course be dishonest to pretend that the Labour Party was the end of Jimmy Reid’s political journey. He left Labour – doubtless disillusioned by the New Labour agenda which was the antithesis of all he stood for – and joined the Scottish National Party in his last years. Now, I am not going to abuse this invitation by wading in to the critically important debate on Scottish independence. That is a debate for the Scottish people, and it is for the trade unions here in Scotland to formulate their views on that debate. But I hope it will not be too controversial if I make two points. First, I believe that whatever the outcome of the referendum, the working people of all the nations of Great Britain will find a way to stay united in their struggles. And second, it is my firm conviction that, partisan of his own country, Scotland, as he surely was, Jimmy Reid’s politics cannot be defined as nationalist. He was, like all the finest working-class leaders, an internationalist. The brotherhood and sisterhood of man was his objective. “Man to man the world o’er will brothers be for aw’that” as your national poet has it. Jimmy’s was a world view without a trace of xenophobia or of hating and fearing “the other”. Internationalism is, of course, recast and recast again as the world changes and the working-class movement develops. But it remains the cornerstone of our outlook. Let me give an example of how a new internationalism is emerging. Some of you may know that Unite has recently launched an ambitious community membership programme, aiming to extend our union family to those who, for one reason or another, are not in employment. As part of this initiative, we have opened a centre in Cable Street in London’s East End, a historic location where workers of all faiths and of none united to defeat the Daily Mail’s Mosley Blackshirts in the 1930s. Today, it is at the heart of a vibrant Bengali community, well represented when I went to open the centre. And at the opening event much of the talk was about what trade unions could do here to assist garment workers in Bangladesh, more than a thousand of whom had just died in the scandalous factory collapse in Dhaka – a cause that Unite is involved in through our association with the international union Workers Uniting. Here is a new circuit of working-class internationalism forming, and there could be many other examples. Globalisation has knit the world economy closer together, in the interests of employers. And it must be answered by new forms of labour globalisation, that seeks to level the international playing field. Such internationalism was part of Jimmy Reid’s make-up from day one – extending it may be the best tribute to his memory. Those sentiments were true in 1972, when Jimmy expressed them, and how much more true are they today? Far more than forty years ago, ordinary people feel disempowered, living lives controlled by forces above and beyond them. The only right contemporary society really enshrines are market rights – the right to consume and choose in the market-place. The vision of citizenship is cramped, and our role as workers is derided as a “producer interest”. People are treated as simply life-support systems for credit cards. And this vast abstraction – the market – entirely dominates the actual, living society in which we produce and consume, develop communities, enjoy leisure, form friendships and relationships, and raise children. The all-powerful market destroys established industries and the livelihoods and lifestyles which developed around them. And, by exalting individualism, it actually renders individuals powerless. That’s because, as Jimmy Reid understood, we can only exercise power together. On our own, a very few can get rich, many more live lives stunted by poverty, and most of us get by. That’s the only control any of us can exercise. But united, of course, we can start to shape things. That is the essence of democracy. Alienation is the price we pay for reducing democracy to a once-in-five-years voting ritual, when it ought to be about taking collective charge of all the circumstances that shape our lives. Property has always seen democracy as its enemy. It concedes as little power as possible to the democratic process, in order that the majority with little or no stake in the capitalist system do not use the collective authority which democracy bestows to bring about radical changes. The result we can see around us. We have a food bank, bedroom-tax, workfare-democracy because the food bank, workfare and the Bedroom Tax are the sort of things you can only do to people who feel they have no power. And that is where trade unions come in. Of all the myriad organizations thrown up by our society, we have the greatest numbers, the deepest roots and, when we get it right, the clearest sense of purpose. Above all, we speak for those who are otherwise voiceless. When we are strong, society has progressed, as after 1945, and in the 1960s and early 1970s. Trade unionism allows working men and women to have at least a chance of “determining their own destiny” as Reid says. Yes, we need to change. The industrial world is not as it was when Jimmy Reid, Jimmy Airlie and Sammy Barr led that inspiring sit-in at UCS. But we need to capture that spirit undiluted. More than ever, destiny determines us in contemporary Britain. We have to turn that round. The main ingredient we can take from the great struggles of the past is self-confidence. Defeat and decline have sapped the self-belief in our movement for too long. I believe that is starting to change. We have started winning some industrial victories again. We are organising new members in a way we have not for two generations. We are engaging with the wider community. And our ideas are starting to make political headway. The failure of neo-liberalism, of the unrestrained market, are now evident. Broad sections of the public are looking for an alternative, socially just and emancipating. And I believe it is evident that renewed trade unionism must be at the heart of that alternative. That is what Jimmy Reid would have wanted. For Scotland. For Britain and for the world. It falls to us to carry that vision forward. The makey-upy statistics on how much a single police force will ‘save’ Scotland offers just one more example of ‘hopeonomics’ – accountants balance sheets comprising of ideology rather than numbers. As interest in local democracy falters while the position of the powerful in society becomes more powerful again, all set against a backdrop of powerful and influential millionaires, the rest of us need a signal from Scotland’s politicians that we still matter.